Telling the truth is always the best, a lesson parents are eager to teach young ones. Welcome, Flo, the Lyin' Fly, to Hermie's delightful world. Like the little boy who cried "wolf," Flo thinks it's fun to tell stories that are not true. When her friends discover they can't trust her, they refuse to believe her when there's real trouble. Drawing from Proverbs 19:5, which says no one gets away with a lie, Flo the Lyin' Fly sets out to teach children, through incredibly humorous situations the importance of telling the truth no matter what the circumstance. Flo: The Lyin' Fly reunites the voice talents of Tim Conway, Don Knotts and Melissa Disney. This all-star cast is also joined by Third Day as the Water Beetles, Frank Peretti as Puffy the Dragonfly, and Vicki Lawrence as Flo! - Publisher Telling the truth is always the best, a lesson parents are eager to teach young ones. Welcome, Flo, the Lyin' Fly, to Hermie's delightful world. Like the little boy who cried "wolf," Flo thinks it's fun to tell stories that are not true. When her friends discover they can't trust her, they refuse to believe her when there's real trouble. Drawing from Proverbs 19:5, which says no one gets away with a lie, Flo the Lyin' Fly sets out to teach children, through incredibly humorous situations the importance of telling the truth no matter what the circumstance. 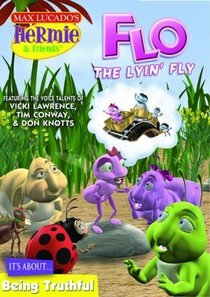 About "Flo the Lyin' Fly (#02 in Hermie And Friends Series)"